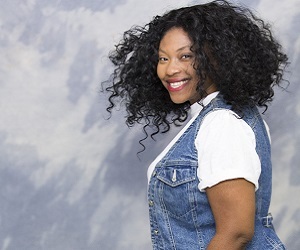 Gospel Charting Artist and Multilingual Singer Songwriter Palmyre Seraphin received an FM Radio invitation to appear on the “D Suite” show Hosted by Media Personality & Influencer Cheryl L. Donovan. Tune in March 23 rd. to Rhema Gospel Radio at 11 AM CST on 101.5 FM as Palmyre Seraphin will go behind the song “He took care of me“. Palmyre Seraphin is currently on the roster at Devine Jamz Gospel Network where she released her first English project “You better know what time it is” in October 2018. In the first week of a national radio airplay campaign the song hit 3 separate DRT Global Top Airplay Charts. Palmyre’s song hit DRT Global Top 50 Gospel / Inspirational Airplay Chart, DRT Global Top 150 Independent Airplay Chart, and DRT Global Top 200 Airplay Chart. The song remained on the gospel chart 16 weeks consecutively. “He took care of me” will be Palmyre’s 2nd English release, which she wrote in her car a few years ago as an anthem and gratitude of how God kept her safe during a lonely time in New York City. The release date will be announced by Devine Jamz Gospel Network and it will be listed on Palmyre’s Facebook Page that is spelled “P A L M Y R E S E R A P H I N”. In her full-time role, Palmyre is an Educator with a master’s degree who teach in her local community. Somehow, she manages to perform in live shows in the New York City surrounding area and occasionally travel for shows at a greater distance. Despite all the challenges Palmyre has encountered when ministering, she is determined to continue spreading the gospel through songs and hymns. Keep watch for the release date for “He took care of me” which will be shared on Palmyre’s Facebook Page and through Devine Jamz Gospel Network.